This is an extra-long metal keyboard arm. 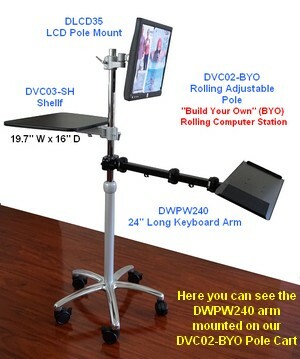 It includes the 24 inch long arm, the pole-clamp and the keyboard tray. It is the longest keyboard arm in the market: 24". It has 4 articulations. Use the keyboard in any direction. 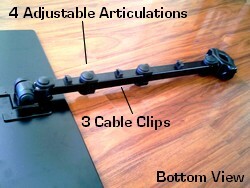 The keyboard tray -not the arm- tilts down to 45 degrees and rotates. The arm is always at around 90 degrees to the pole. 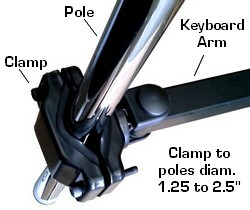 Easily adjust the height of the arm along the pole by simply loosening the clamp's bolts. 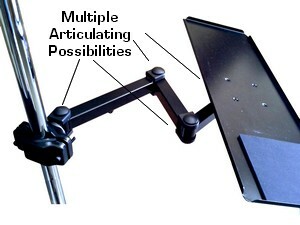 Atttach this keyboard arm to a wall and then add a monitor wall mount above it, like our DW170DS, and you have just created a space-saving "wall computer workstation". 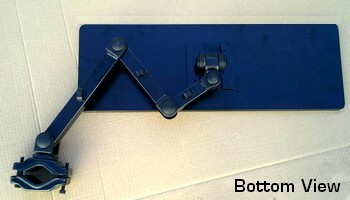 If your bed is next to a wall, use this set-up in bed, and then swing the arm away when not in use. 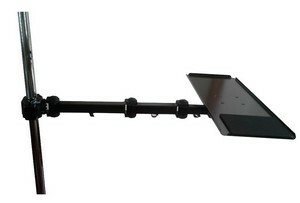 For wall mounting, select the wall-mount version.